It was only few years ago that resort, pre-spring, pre-fall, mid-season or what ever you like to call them – collections had only a minor role to play in between more prominent spring summer and autumn winter mainline collections. But as the fashion system is constantly increasing its phase these mid-season collections are becoming more predominant with their own dedicated advertising campaigns, show schedules and presentation methods. In the industry, that is all about newness, the pressure for designers to constantly come up with new ideas is a nonstop job. It’s no wonder that some designers are buckling under the pressure to create and innovate. How can you even do it if the typical show schedule starts in January with women’s pre-fall[ref]Mostly presented in New York, midseason titles have adopted American spelling as opposed to mainline collections where the roots are in Europe and this is reflected in the spelling. [/ref] followed by men’s fall, spring summer couture before moving on to March for women’s main line autumn winter, May it’s the men’s pre spring and women’s report, Men’s mainline spring summer and autumn winter couture in June before it starts again – and that’s 6 collections for a designer just concentrating on one label. The schedule looks ridiculous to me. Such is the speed of fashion production and need to create new things these days that the whole system is saturated with stuff. Because of this, even the greatest of ideas now feel ephemeral never mind the mediocre ideas that usually disappear as soon as they appear. Nicolas Ghesquiere reflected on the pressures of constantly evolving design aesthetics in his first ever interview after leaving Balenciaga in November given to System magazine. 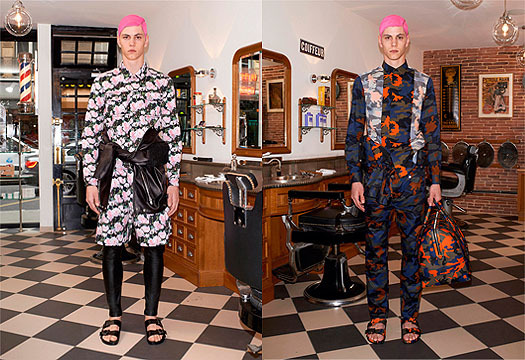 Ricardo Tisci has systematically developed his own design vocabulary at Givenchy over the last eight years he has been designing for the brand. Much criticized in the beginning for abruptly abandoning the original obvious house signatures developed by Hubert de Givenchy between 1952 when the house was founded until 1995 when he retired, Tisci’s stubbornness has ensured that certain new codes are now associated with the brand and much loved by the coolest of cool fashion boys, dangerous and daring women, those with catholic leniencies in aesthetics and of course Kanye West. Religious motifs, American iconography, contrasting elements, purity in the use of materials along with the use of black, white and the occasional highlights are all part of Tisci’s Givenchy DNA. But since his first collection this year, he has been developing an idea in both his menswear and womenswear collections across different seasons that adds a welcome element to his vocabulary. 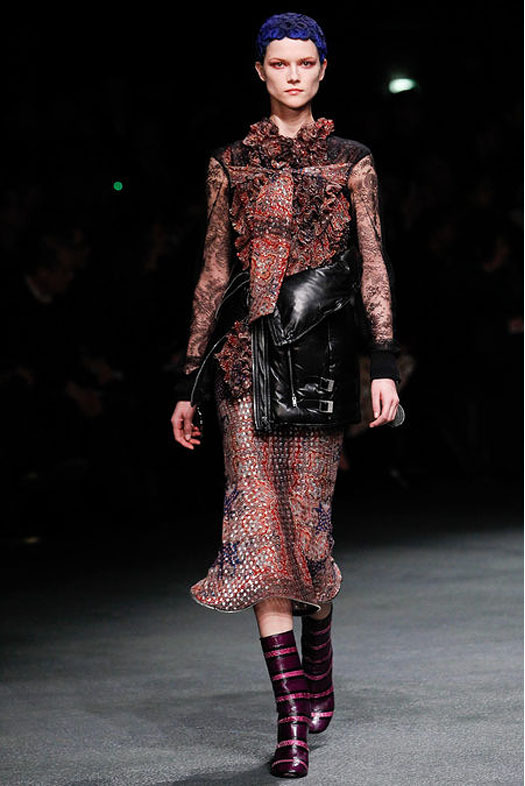 The idea started to take shape in the pre fall 2013 women collection, presented on the 7th of January this year. What initially appears as a styling idea in looks 27 and 29 with the nylon and leather puffa jackets tied around the waist, drawing emphasis to the mid part of the body is subtly mirrored in the skirt detailing and waist wrap with similar codes in looks 30 and 32. Particularly the look 32 creates a new intriguing silhouette as the waist garment appears too short to be considered a skirt and too big to waived off as just detailing. 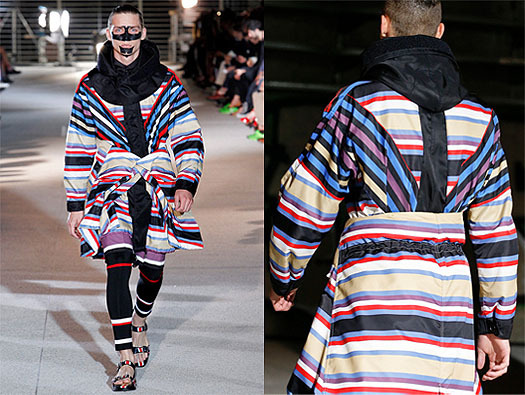 The idea continued to live in the men’s a/w show presented in Paris on the 18th January. 13 models, including the occasional masculine female model scatted in between the army of men, out of the 48 looks presented were styled with various outdoor jackets and coats wrapped around the waist. Whilst treated as a mere styling detail, it looked noteworthy combined with the shortest of shorts (perhaps too short for men), which emphasized the effect. The dialogue between men’s and womenswear and the evolution of the idea had begun. The idea got its third and so far the most effective outing in the women’s a/w 2013 mainline collection presented in Paris on the 3rd March. From a waist wrap to a pealing half a jacket, the emphasis remained on the mid part of the body with a more design-orientated application. Here the idea looked well thought and appropriate, continuing the ideas started in pre fall. As the various floral and baroque style flame patters merge together into abstract haze on light-weight fabrics in varying combinations, the soft but structured jackets halves added contrast as demonstrated in look 43. Here the idea really works. It was therefore rather disappointing to see that the idea continued as a mere styling exercise in the men’s pre spring 2014 collection presented on 27th May and flimsy and un-usable addition in the men’s s/s mainline shows presented in Paris on the 28th June. Perhaps it is a more difficult task to incorporate an idea like this into menswear, but not impossibility. Women’s resort 2014 collection presented on 10th June made a good effort in cultivating the idea as integrated design detailing but the application lacked the excitements and attitude seen in the mainline collection. Look 22 stands out with its attempt to explore alternative proportions. Whilst I’ve never been too keen on overt styling ideas or styling over design, I see the relevance of the jacket styling in relation to developing a new silhouette proposition. Nevertheless, the design application of this seen on womenswear is more exiting and relevant particularity at its early stages in the pre-fall and in the main line autumn winter collection where the idea has real design merit. Overall there is something lovely about a designer aiming to cultivate design ideas outside the established codes of the house to add to the vocabulary. It shows commitment and brings a welcome relief to looking at collections from other designers where the aesthetic pendulum swings from left to right to left to right every season. Whilst the media and the buying system – not necessarily the customer – is always demanding new stuff, it’s refreshing when a designer is choosing to cultivate ideas even though it’s not necessarily always going to work. Though some may find it boring and lacking in creativity, I’d like to think the Ricardo Tisci is doing something daring. It is perhaps the singularity of his vision that will ultimately bring back the customers season after season, not just new ideas.